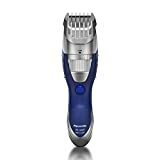 Panasonic Milano Series ER-GB40-S – The Best Beard Trimmer ? Panasonic is a well-known name in the electronics industry, so it was inevitable that the company would also be part of the electric shaver niche. This company is famous for offering feature-laden and sturdy products at very reasonable prices, and the Panasonic Milano ER-GB40-S follows that philosophy to the letter. However, while it may technically be a hair and body trimmer, it’s arguably the best beard trimmer that you will find right now. It is precisely this reason why Panasonic itself refers to it as a beard trimmer on its website rather than an all-around trimmer. About half of the customers give the Panasonic Milano a perfect grade, and the other half give it a solid rating. It helps that for some reason most of the customers do not have unrealistic expectations about very close shaves, and that for most of them they know its true purpose. It is for styling and trimming your beard, and when it comes to that function it is basically unparalleled in the industry. They also mention other factors, such as how easy it is to use and how affordable it is, with some minor complaints here and there. On the whole though, they are mostly happy with their purchase. As for its other functions, yes you can use it for the hair on your head and for the rest of your body. Amazingly, even without that additional feature it already looks like a good buy. With it, it seems like a must-buy item. While the positive features cover all the most important aspects, some of the drawbacks do prove to be somewhat annoying. It’s not that these negatives outweigh the positives (they absolutely do not), but they do provide a list of grievances that Panasonic should really address if they want the ER-GB40-S to be considered among the best of the best. First off, the charging time is, to put it mildly, ridiculous. While you get 50 minutes of use when fully charged, that comes only after you have charged it for 15 hours! That’s fifteen hours, in case you were wondering if that was a misprint of some sort. Your charging woes are compounded when you realize that the unit lights up when you are charging it, but it does not give any indication when it is fully charged. You have to guess or take note when you plug it in. One other drawback is that the base is bulky. This mean you will have a very sturdy base to hold it in but you have to plan for extra space on the counter. Finally, while you can clean it by holding it under running water, you are also supposed to oil the blade every time you use it. In fact, the recommendation in the manual states that you have to oil it before you use it, and then you have to oil it again when you are done. This can be a bit time consuming. Bottom line…Should You Buy The Panasonic Milano? As a facial and body shaver, it is better than average, and its value increases when you find it on a discount online, which is very easy to do. However, out of all the wonderful features this Panasonic Milano Series model offers, its 19 different trim settings easily takes the cake. You can really make sure that you get the beard length you want and you don’t have to settle for anything less. Add the ergonomics and the safety features, and what you have is the ultimate beard trimmer so far. With the ER-GB40-S, you can be part of the Red Sox and still look good, and you can even give John Snow and Robb Stark of Game of Thrones a run for their money. Looking good with a beard has never been so easy until now.